Our communities, state, nation, and world face increasingly complex challenges that impact our environment, our economy and our society. Successful sustainability pursues balanced, ethical solutions that are economically viable, environmentally sound and socially just so that current and future generations may thrive. Institutions of higher education are crucial to preparing graduates equipped to lead, to serve, and to solve complex social, environmental and economic problems. As NC State integrates sustainability in its operations, academics and research, the university improves efficiency and stewardship while also developing leaders and innovations for a more sustainable future. A sustainable campus promotes socially just and vibrant communities, is economically responsible and conserves finite resources. Preparing students and innovations for a more sustainable world. Preserving air quality while reducing climate impacts. Accelerating campus efficiency and cost-savings. Creating an efficient, sustainable campus. Propelling sustainable transportation on campus. Preserving quantity and quality of a natural resource. Improving human well-being and quality of life. Promoting social sustainability for all. Minimizing our impact on nature. Striving for zero waste on campus. Promoting healthy, fresh and sustainable nutrition. Equipping campus with sustainable materials. 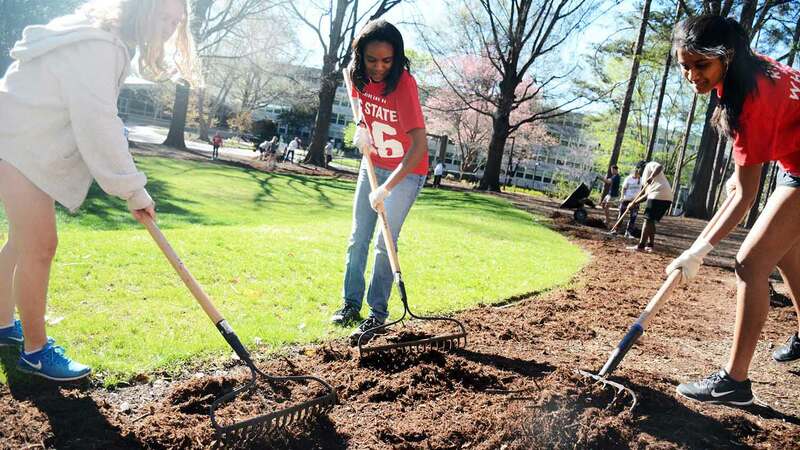 NC State’s sustainability efforts are rooted in numerous sustainability-related policies, procedures and commitments.